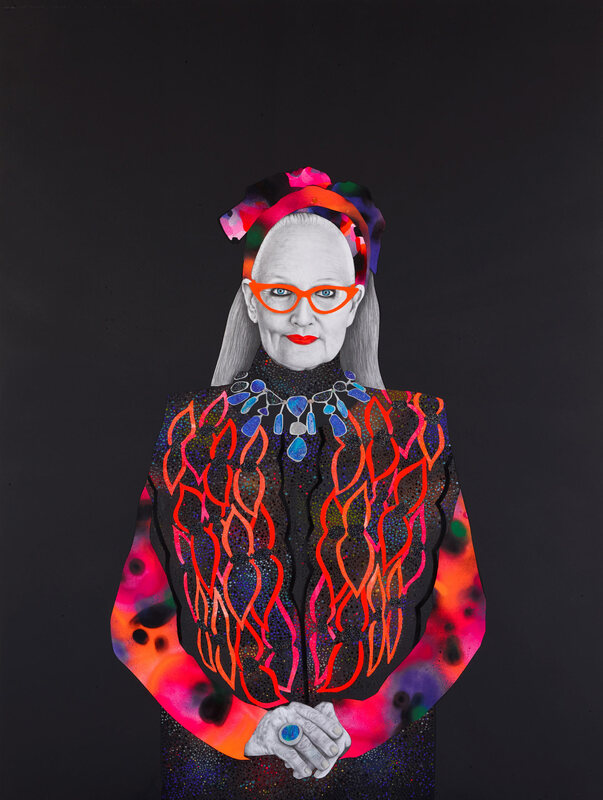 ‘This painting of Australian fashion designer Linda Jackson is the twin-soul portrait of my 2015 Archibald Prize finalist portrait of Jenny Kee,’ says Carla Fletcher. ‘Together they are magic, transcendent, creative collaborators who electrified Australia with bolts of luminous colour and dreaming. From their first meeting in the early 1970s there was an instant soul connection, a connection that remains strong. ‘Inspired by the colour and energy of the Australian landscape, Jackson crusaded a new path for Australian fashion. She explored new approaches to textiles and incorporated never-before-seen bold Australian motifs drawn from nature, including her magical neon opal prints and Sturt’s Desert Pea flowers. Born in Melbourne in 1978, Fletcher has a Bachelor of Fine Art Drawing (with distinction) from RMIT. She has had regular solo exhibitions since 2003 and has been represented in various group shows. She has been a finalist in the Sulman Prize (2013), Portia Geach Memorial Award (2012) and Archibald Prize (2010, 2014 and 2015).